Titanium has become a popular choice for wedding bands and engagement rings. This durable material will stand up to daily wear, which is very important in an engagement ring. It looks lovely with diamonds and other gems as well. Several stores specialize in titanium engagement rings, and one of them may have your dream ring in stock. Also known as The Titanium Workshop, TitaniumRings.com has been manufacturing and selling rings for over two decades. Each ring is designed and made by craftsman in Seattle, Washington, so you receive the perfect ring for you. There are dozens of different engagement ring designs available from TitaniumRings.com. You can choose from simple titanium and diamond solitaires, colorful accents, black diamond coatings, and creative and elaborate designs. Many rings take the classics to a whole new level. The Electra Solitaire features an electric blue anodized titanium channel in the traditional band, along with a single prong-set diamond. 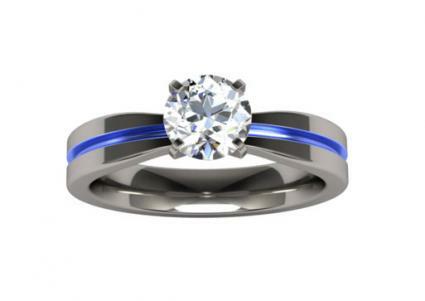 There are also options for men's engagement rings. 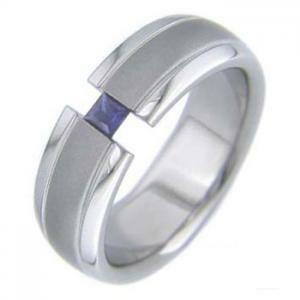 The Facia Inset Titanium Ring is a masculine and beautiful choice. A small diamond is inset in a plain band of titanium. Prices range from under $200 to over $8,000, depending on the size and number of diamonds included in the design. Although TitaniumRings.com is based in Seattle, they do not sell rings out of their workshop. The entire selection is available online. According to reviews on WeddingWire, this is a good company to work with when shopping for titanium rings. Past customers have been very happy with the selection, shipping speed, quality, customer service, and custom engraving. When you purchase a ring, your order is given to a designated ring maker at the workshop. Since your ring is individually crafted, it can take about 10 to 20 days to complete your order. TitaniumRings.com then ships your order with FedEx, which can take up to seven additional days. If your order is over $199, you are eligible for free next-day shipping through FedEx. Rush order processing is also available for a fee. TitaniumRings.com accepts returns, usually within a 15-day period after you receive your order. However, if you changed your mind about the ring, you may need to pay a restocking fee. The shop requests that customers contact them for mailing instructions when returning a ring. 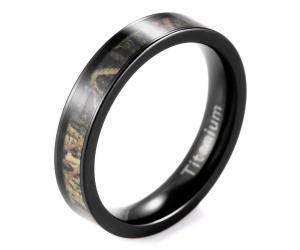 There is a lifetime warranty for workmanship on all rings from TitaniumRings.com. If you're interested in a handcrafted titanium engagement ring, Brink Jewelry is another great shopping option. Each ring is artist-crafted and unique. You'll find a range of styles, or you can work with the company to create your perfect ring. You'll find engagement rings featuring diamonds, sapphires, rubies, and many other precious gems. Styles range from dramatic swooping designs to simpler solitaire settings. Many of the rings feature tension settings. The elegant Twist of Fate ring features an asymmetrical tension setting that securely holds a round-cut diamond. The Linear Moon ring also features a round diamond in a tension setting, and the design is perfect for men or women. Prices range from about $250 for simple designs with small gems to over $4,000 for more elaborate settings and larger diamonds. This store doesn't have a brick and mortar storefront, so you can't see the rings in person before ordering. However, all of the designs are available online. Brink Jewelry has positive feedback from dozens of past customers. Reviews praise the custom designs, excellent craftsmanship, and customer service. Since every ring is made by hand, it can take a little longer to get these engagement rings than those that are machine-crafted. Expect your ring to ship within 25 days of your final payment. Rush processing is available in some cases. Because each ring is custom made, returns for incorrect sizing or change of mind will only be worth a 40% store credit. Brink Jewelry offers a full warranty on all rings, as well as free lifetime polishing. Boone Rings specializes in all types of titanium rings. They have an excellent selection of stone-setting or engagement-style rings for both men and women. All rings are artist-crafted in Georgia. Boone Rings is very proud of its secure tension settings, and many of the stone-setting rings feature this type of mount for the stone. Rings are available in a wide range of finishes. The Accents with Princess design has a brushed band in the center with shiny outer edges. A small stone is tension set in the middle, and you can choose any gemstone. This style is perfect for a man or a woman. The Prongs with Mokume Gane ring offers a unique take on the solitaire. The band is customizable titanium mokume gane, and the center cubic zirconia is prong-set for an eye-catching effect. You can substitute any gem for the cubic zirconia and select from a range of finishes for the band. Boone Rings doesn't have a retail store, but they offer the full line of rings online. You can also work directly with the company to custom-design the ring of your dreams. Reviewers on WeddingWire loved the shopping experience at Boone Rings. They especially loved the custom designs, quick turn-around time, and quality workmanship. Many past customers also praise the company's customer service and communication. 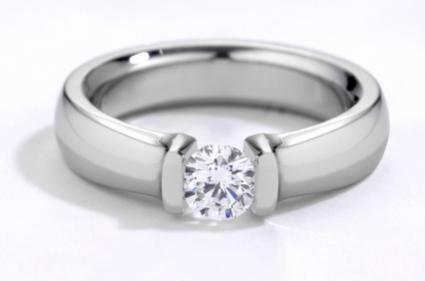 Boone Rings doesn't list a specific turn-around time for orders, but many customers stated in Wedding Wire reviews that they received their rings within a few days. Shipping is fast and affordable. You can return your ring within 30 days for a refund, but you'll need to pay a restocking fee. If you need your ring resized, Boone Rings will do it free of charge. Their warranty also covers repairs and refinishing. Etsy is an online artist marketplace and a good source for titanium engagement rings. If you're looking for more handcrafted options, this is a good place to shop. Amazon.com offers a few engagement rings made of titanium. These rings aren't handmade, but you can find nice options for both men and women. Zales has a number of pretty titanium options, many featuring tension settings and diamonds. You'll also find titanium engagement rings for men. Whether you're looking for a simple titanium band with a center stone or a more elaborate offset design, there's an engagement ring out there that's perfect for your needs. Take some time to peruse the options at the shops specializing in this unique material; your ring is out there waiting for you.